The Numpties are travelling for a month so I was rather full of trepidation about what was going to come up this week when we would have to solve the Listener without that reassuring set of resources – Sabre doing knights moves with encoded jumbled numbers, a carte blanche with no symmetry? No, surely they wouldn’t be so dastardly. Ah, Charybdis! A familiar Magpie name (not to be confused with Chorybdis except for a recent puzzle where they sneakily co-operated and also starring in a current Inquisitor in the Indie) – he gets everywhere – but to my dismay not the bar. I scan the grid for that reassuring demonstration that Charybdis qualifies for the Listener setters’ wine connoisseur’s elite and find only ‘Give bar a miss unless ordering usages to suit souk? (8)’ A rather clunky surface reading and an even clunkier solution when we decide that it’s an anagram of BAR A MISS, producing ARABISMS. Postscript – no need for concern. 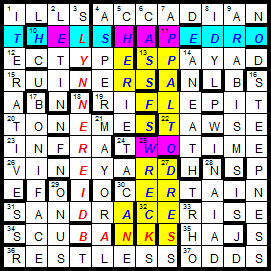 When we had happily worked our way through this generous set of clues, VINEYARD appeared at 26 across, ‘Chateau road [delays] after Marshall blocks way (8) (NEY in VIA + RD). We solved happily and in a couple of hours had a full grid and only then focused on the preamble; ‘An author appears in 14 cells of the grid. Her book title (three words, also 14 cells) needs to be found in its entirety in the grid.’ THE L-SHAPED RO…?’ What is going on here? Where is the OM? I remember the book by LYNNE REID BANKS and the film and there she is in an L shape. Now what? A few minutes confirming my membership of the grid-starers’ club then that Köchel-365 and Channel4.com in the clues as extra words suddenly make sense. 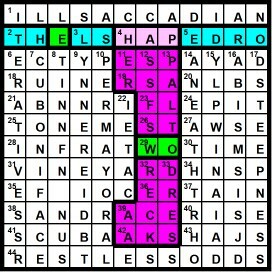 I joyfully read the letters that follow the thematic character L in every one of those extra words and find DRAW NET. TOTAL AREA IS 34. WRAP TITLE TO MAKE WALLS. I (the less mathematical Numpty) had to have the concept of a net explained to me – a two-dimensional representation of a three-dimensional shape that separately indicates each of the faces of the original shape. In the preamble we were told to ‘outline the eight faces involved.’ Does that mean a single outline round the eight or are we expected to outline each of the eight faces? (Yes, I do realize that I was meant to construct the room ‘in imagination only but I couldn’t resist – this was rather reminiscent of Jago’s origami wren, where we also had a sneaky M turning over to give a W, or of that delightful Christmas snowflake). I opted for overkill and outlined each of the faces and coloured them individually in the manner of the net of an L-shaped room that Wikipedia provided for me. Most enjoyable, thank you, Charybdis! Those of you who read Shirley’s blog on Ruslan’s final effort might be wondering why I didn’t blog the numerical. Especially as she drew attention to my apparently going to. For that matter, where was I last week? At a Summer School in Southampton, is the answer, when I had the time to solve the two Listeners but not really much else. For what it’s worth, I thought the Ruslan puzzle contained a very nice idea but once you’d got past the arcane preamble the solve was not too tricky, and for me mostly involved staring at a table of primes generated by (6n+1/ 6n-1) until I found a pair that worked for each clue. Not much else to say about that, except to thank Ruslan for the last time, belatedly, for his efforts. It was his Number or Nummer that drew me into this world for good, so wherever you are, thank you. Last week’s puzzle had a fine finish but the unching was stretching the normal rules to breaking point; thank goodness for easy clues, then! So that’s brought me up-to-date. 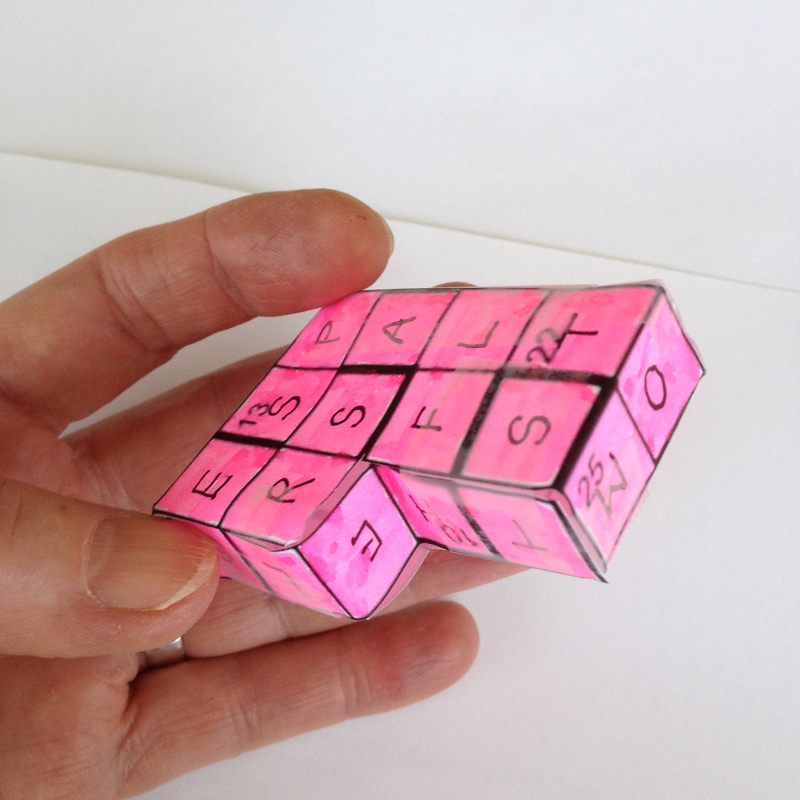 To make up for it all I thought I’d blog an even-numbered puzzle for a change. Very blatantly the theme was some book by Lynne Reid Banks (there she is, in the shape of an L), called The L-Shaped Room. And look, there’s the title in the second row! Well, most of it… so where’s the rest? Hours of staring followed… interrupted by a pleasant trip back to Cambridge. Lots of reminiscing and nostalgia, some familiar faces, and thankfully not a bad day! Back to the puzzle… and more staring. And yet more. The key is clearly in finding that final OM… but I can’t see it! Oh, well. Perhaps looking for the net in another way helps… and, at least, there is a jumble of PRESS FLATS attached to the second row — I suppose that’s the floor, since it’s an L-shape — and a WO underneath. Oh yeah, if you turn that round it sort of reads OM. So that must be it! What a tough endgame! At least two, maybe three times longer than the grid fill. But a very pretty finish, and remarkably clever too. I wonder what the room looks like if you actually build it rather than just sketch the net. This week, we had Charybdis, he of the quirky themes. Remember his last Listener based on the phrase “unexpected item in bagging area” with its tarantula eating the angel food?! 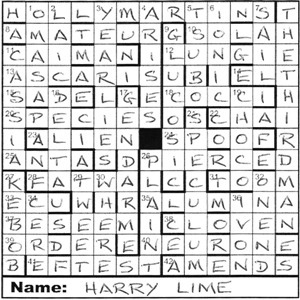 I am sure that he has come up with some tricky clues as well in the past, so I dipped my toe into the acrosses with some trepidation, every clue having an extra word that needed removing before solving. After about 20 minutes, I was wondering whether this really was a Charybdis puzzle… I was solving the clues at breakneck speed. 1ac was ILLS, 2dn LET IN, 15ac RUINERS, 1dn ITERATIVE, 4ac ACCADIAN, and so on. I even solved 11ac Five in variation of whist drive dividing 50 per cent of Dulwich people (5) which was PEDRO. This is given in my 12th edition of Chambers as “see sancho-pedro” which, in turn, is a starred entry in grey highlight, and consequently, I assume, missing from the infamous 13th edition. The answers continued thick and fast and, after about 90 minutes, the grid was complete. 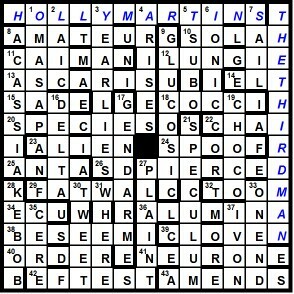 I had identified the meaning of the “Solvers must follow the thematic character…” about half way through, and this enabled me to identify words in unsolved clues which contained the letter L. This certainly helped with some of the trickier clues where the extra word had been cunningly inserted. And so to a simple endgame where we had to identify an author, her work and perform some mental shenanigans. 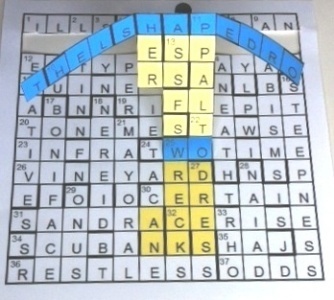 The letters in each clue which followed the L in extra words spelt out Draw net. Total area 34. Wrap title to make walls. I found LYN NEREID BANKS, thinking what a strange name Nereid was, although not really so in today’s world of celebrity weirdness. Of course, it turned out to be LYNNE REID BANKS and her first, and best-known, work could be found in the second row — THE L-SHAPED ROOM… except the final OM had dropped off the right-hand edge of the page! The O and M could be found in rows 6 and 7, but there seemed no obvious way to put a net round them to give an L shape, especially one containing exactly 34 characters and with eight faces. And so began a tortuous hunt on my part trying to work out what Charybdis was doing. The “sort of DARK SCREEN on a higher level, and possibly PRESS FLATS below” were easy to identify, each being in an L shape or reflection. Strangely, however, the flats were above the screen. Moreover, how could I wrap the title when I hadn’t even found it? For me, this was a case of dipping into the puzzle for a few minutes at regular intervals over a period of several days. The red herrings I found were ridiculous. The preamble mentioned “conceptual volume”, and I could see NINE YARDs in the grid so wondered whether there were other measurements that may come into play… I found none. Also, in rows 6 and 7, we had TONEME and TWOTIME and I thought that might somehow mean one M and two Ms — it was not to be. I could see my first failure of the year looming. As I have said before, I dread being in a position where I am trying to get out of a rut that is leading me inexorably to a dead end. It’s like trying to think outside the box when you don’t know whether you’re even in the right box! The breakthrough for me came on the second Monday. I looked up net in Chambers to find “the shape of a three-dimensional figure when laid out flat (maths)”. A quick snip snip snip, and I was home and dry. It reminded me a bit of Jago’s origami wren from Christmas 2009 where M and Z became E and M with 90° rotation; here we had WO becoming OM when rotated 180°. I can’t believe it took me so long to suss out what was happening, especially since others probably solved it in the blink of an eye. So thanks to Charybdis for another testing puzzle, and I breathed a sigh of relief that my all-correct run for this year was still intact. That would have to wait for another week… perhaps not too far ahead! Everything failed today – computer, both printers and an iPad update, so I was fairly late downloading ‘Shades of Green’ by Gos with no ink to print it, and emails had arrived from two friends saying that they had already completed it when our solve finally started thirty minutes after it appeared on-line. Was that worrying or reassuring? Mildly worrying really, as, no doubt the editors will have a few ‘stinkers’ lined up to ‘compensate’ for some recent ‘easies’. “Shades of Green? Must be Robin Hood” was my first thought – are we going to be finding the Sheriff of Nottingham as the hunter and Robin as the hunted?” I did a quick run through the clues looking for evidence that Gos qualifies for the Listener Oenophile Organisation (and found none!) but I did find rather a lot of very obvious hidden clues: ‘Portion of mocha weed’ = CHAW, ‘Area of about four square yards forms part of district suboffice’ = TSUBA, ‘There’s some advantage in projecting column’ = ANTA, ‘It’s descriptive of scale of cheap labour at fixed intervals’ = ELO (chEapLabOur), and ‘Things worn by Indians occupying far-flung islands’ = LUNGIS. A number of other solutions leapt out at us, like ‘Revised notice, although short, is a shot in the arm’ (NOTIC(e)* = TONIC) and ‘Foreign character is often seen at mouth of river’ (Double definition = DELTA and it quickly became clear that we were with a different GREENE when Orson Welles appeared down the right hand side of our grid and Joseph Cotten filled the unclued light along the top of our grid. Ah we all remember that chase through the sewers of Vienna and the theme- I can hear it now – as well as Harry Lime’s assessment of the Swiss (apparently that was added by Orson Welles; it wasn’t in the original Greene novel). “You know what the fellow said – in Italy, for thirty years under the Borgias, they had warfare, terror, murder and bloodshed, but they produced Michelangelo, Leonardo da Vinci and the Renaissance. In Switzerland, they had brotherly love, they had five hundred years of democracy and peace – and what did that produce? The cuckoo clock. So long Holly.” You can imagine how the Swiss around here (we live just above Geneva) love that assessment of their contribution to World advancement. So it was a speedy grid-fill and a moment of pleasure when we managed to make JOSEPH COTTEN convert to HOLLY MARTINS and ORSON WELLES to THE THIRD MAN. We had to do a bit of Googling to check the spelling of MARTINS but had no problem with HARRY LIME. Thank you, Gos. 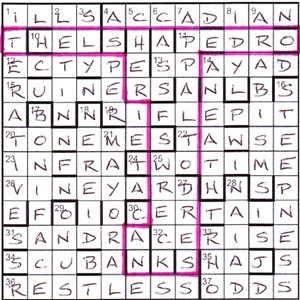 Gos puzzles have tended to be of a literary nature, including Wilkie Collins, Ellery Queen, Edgar Allen Poe and, most recently, John Dickson Carr. Here, the preamble talks of the “major players”, so perhaps a theatrical work was on the cards. The only slightly worrying aspect of the puzzle was that there were only two entries which connected the left and right halves of the grid; unusually, the central square was blocked. 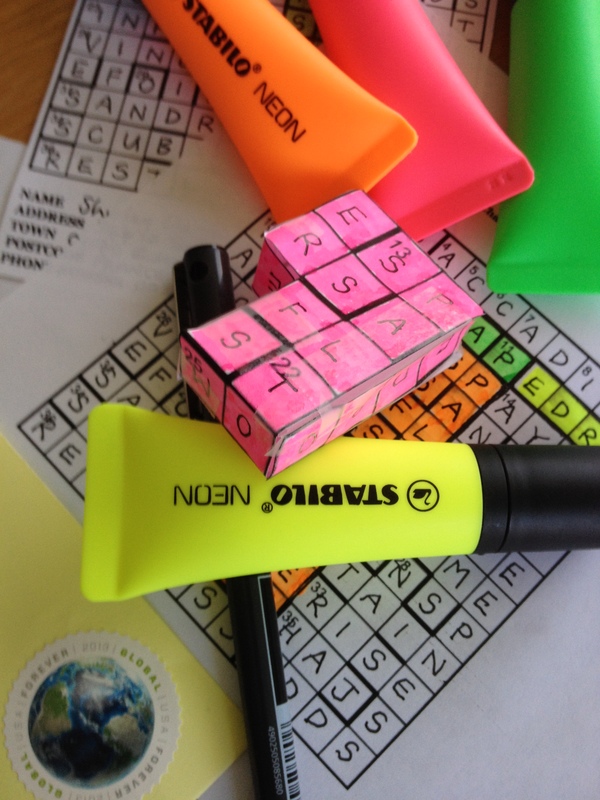 The clues, however, were all normal, so a straightforward solve was a possibility. I went through the clues in order, and was pleased to find that I had solved twenty clues after as many minutes. Two in particular needed a bit of understanding. 32dn At a stretch, director Stanley gets his head down (5, two words) was ON END and a reference to film director Stanley Donen (still alive aged 90) who was responsible for a host of fine films including Singin’ in the Rain (with Gene Kelly), Seven Brides for Seven Brothers, Arabesque and Bedazzled. 36dn French guy returns the day after Hallowe’en (4) was IVON (NOV 1<) and I needed my trusty 11th edition of Chambers to verify that it was a variation of the French name Yves. At this point, I could also see that the right-hand unclued entry was ·RSO·W·····, and it wasn’t rocket science to see ORSON WELLES lurking there. With the title, Shades of Green, Graham Greene, The Third Man and Harry Lime soon came to mind. I needed Wiki to connect JOSEPH COTTEN across the top of the grid with the character he played, Holly Martins. In the final grid, HOLLY MARTINS replaces Cotten, and THE THIRD MAN replaces Welles. It didn’t take too long for me to finish the grid, and an enjoyable, if fairly easy, puzzle came to an end. For some reason, I particularly liked the clue at 11ac Dangerous animal? Prepare to shoot one, following compliance (6) with its sadistic image of a poor, obedient lion… well, you get the picture!